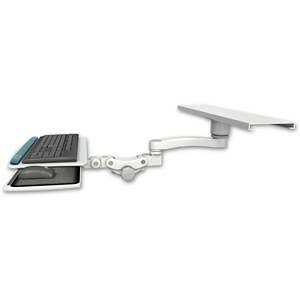 Ultra Under Cabinet Keyboard Mount | ICWUSA.com Inc.
ICW’s Ultra Under Cabinet Keyboard Mount attaches securely beneath an overhead cabinet, pulls out when needed and folds up and out of the way when not in use. This sleek arm makes your workspace more comfortable with 7.5” (19 cm) of keyboard height adjustment. The arm slides horizontally on a 28” (71.12 cm) track so you can position your keyboard exactly where you need it. When not in use, you can fold the keyboard compactly under the track. The model shown features a poly keyboard tray with a mouse tray that slides out on both the left and right sides. The arm is built with aircraft-quality aluminum and heavy-duty internal components for strength, durability and light weight. This unit has an attractive, lasting finish. Hand assembly ensures that a quality product is shipped to you.